Michael Phelps, the most decorated Olympian in history, is a multitasker. “In the morning when I do take a shower, I’m brushing my teeth in the shower,” said the now-retired athlete. As one of the fastest swimmers in the world, Phelps knows a thing or two about saving time. But these days, he’s all about saving water. 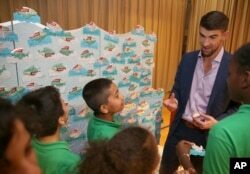 Phelps was recently in New York to promote his partnership with Colgate toothpaste and raise awareness around water conservation. “Water has been such a big part of my life and important part of my life. And for me, it’s an honor and a pleasure to be able to spread the word that we need to conserve as much as we can,” he said. The Colgate Save Water campaign centers on the ultra-simple practice of turning off the tap while brushing your teeth. Phelps said the surprising stats around water waste blew his mind. FILE - United States' Michael Phelps competes in the men's 4 x 100-meter medley relay final during the swimming competitions at the 2016 Summer Olympics, Aug. 13, 2016, in Rio de Janeiro, Brazil. With Earth Day around the corner, Colgate has created a water-activated drain sticker to remind users to conserve. When wet, the sticker reveals the message “Turn off the faucet.” It’s currently only available at Walmart stores in a special package of the brand’s Total toothpaste, but consumers can also pledge online to save water and share their resolution via social media. Owners of a smart speaker such as the Google Home or Amazon Alexa can also use voice commands like “Hey Google, talk to Save Water by Colgate” to enable the sound of running water to play while their tap is off. With about 71 percent, or 4.3 billion, of the world’s population experiencing moderate to severe water scarcity at least one month out of the year, Phelps said small efforts like this can have a global impact. FILE - Colgate global ambassador Michael Phelps speaks to students in Celebration of Campus Sustainability Month at Alain L. Locke Magnet School, Oct. 19, 2017, in New York. The father of two is no doubt thinking of future generations in his efforts to raise environmental consciousness. It’s just one of many teachings the versatile athlete is passing on. These days, Phelps spends more time practicing his golf swing than his swim stroke, but the core lessons remain the same. “That was something at a very young age that I learned and it was hard. But once I got it, I just believed that I could use my mind, and I could get to any place where I wanted to go,” Phelps said.